Interior Dimensions: 35.125" x 18" x 20" - 15" base / 5" lid - 48 lbs. Filled with 2" sheet foam. 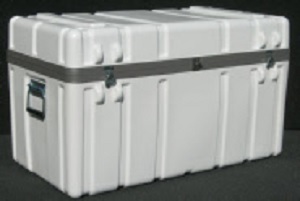 These polyethylene cases, with ball-bearing wheels , are engineered for one person to handle heavy loads easily. Designed to protect valuable and sensitive equipment, they are strong enough to be shipped UPS and even through airline baggage handling. These cases are lightweight, yet durable for reliable convenience and long life. A full length heavy-duty piano hinge, two military style quarter turn latches, spring loaded handle and to insure sage transit of its contents, a padlock loop. The easy-to-clean surfaces are impervious to solvents.